Warner split the Jamaican pair of Shannon Kalawan and Nicole Foster, to earn the silver medal in 58.14 seconds, solidifying her IAAF World Jr. Championships qualifying mark, which improves her own national record. Kalawan ran 56.29 to break a 13-year old championships record. "I know I had to get out if I wanted to stay in the race because these Jamaicans, they going out hard," explained Warner, who has two U17 Girls 800m bronze medals to go with U17 Girls 4x100m Relay bronze as well as U17 and U20 Girls 4x400m Relay silver medals. "So, I had to go just as hard, make a clean race, no chipping, trust myself, trust God and my coach that I could do it." Before Warner's medal, debutant Rikkoi Brathwaite and L'T'Sha Fahie were both fourth respectively during Saturday's opening day of the in the U18 Boys and U20 Girls 100m dashes. Brathwaite-just the second BVI male to make a 100m final in the territory's 40 years of Carifta Games participation, narrowly missed a bronze medal by 0.03 seconds, finising fourth in 10.69 seconds. He dropped his best from 10.92 a week ago at the Elmore Stoutt High School inter-house championships, to 10.88 in the prelims to advance. The U20 Girls 100m final was a historic one for the Virgin Islands as the BVI's Nelda Huggins and Fahie along with USVI's Nia Jack, all advanced to the final. Jack ran a personal best of 11.70 seconds-which qualified her for the IAAF World Jr. Championships later this year-to finish ahead of Huggins' 11.80 as both advanced from the heat. Fahie rode a 3.2 meters per second wind and placed second in 11.71. After a personal best of 53.72 seconds in the U20 Girls 400m preliminaries, Tarika "Tinker Bell" Moses finished fifth in the final in 54.02. Judine Lacey won her U18 Girls 400m heat in 56.56 seconds, before leg troubles limited her effectiveness in the final where she ran 57.04 for eight. In the boys equivalent, debutant Rackeel Jack ran 49.57 to finish sixth, after advancing with 49.64 in fourth place. It marked the first time in his 40-year Carifta Games history, that the BVI had a finalist in all four male and female divisions. K'Cei Moses was a non advancing sixth in his U18 Boys 400m heat in 51.46 seconds. Counterpart Shaniyah Caul ran 1:00.06 in fifth. The BVI pair of U18 Girls High Jumpers, Z'Niah Hutchinson and Xiomara "Gia" Malone, settled for 1.55m after missing 1.60. 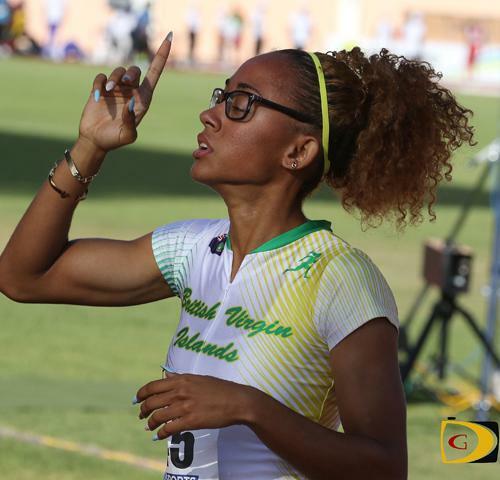 Beyonce DeFreitas dropped the fastest time in the U18 Girls final of 24.14 seconds, and will face the starter's gun this evening, as well as Fahie, who ran a personal best of 24.77 in her U20 Girls race to finish fourth. Zacharia Frett was among those not advancing in the 200m after finishing her U18 Girls race in 25.14. K'cei Moses ran 22.45 for fourth in his U18 Boys race. Todman's 22.01 also did not make the finals cut. In Sunday's U18 Boys Discus Throw, BVI's Djimon Gumbs finished sixth with a heave of 16.20m. Kiwanna Emmanuel's only legal U20 Girls Discus Throw measured 29.14m, as she fouled her other attempts. The BVI will field an U18 Girls 4x400m relay this evening with Lacey, DeFreitas, Frett and Caul closing the territory's participation in the event.